This super fun children's gourmet cooking set provides a professional look and feel providing everyone with a fun experience. The kids apron slips over the head and ties in the back to fit just about any kitchen helper. If apron is too large for your little helper, you can tie a knot in the head strap to help provide a better fit. 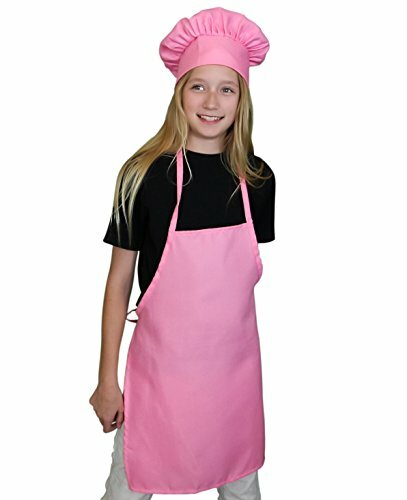 Kids Chef Hat has a large mushroom design to give it the professional look. The adjustable Velcro back provides the perfect non-slip fit. This is not made of cheap plastic material. This set is made of quality and light weight polyester. Holds up to real world cooking and is fully machine washable. If you are not satisfied with the product, return it for a complete refund. Buy now to take advantage of our discount price! PROFESSIONAL LOOK AND FEEL. Engages children in cooking and helps provide a FUN EXPERIENCE! We will also send you a cooking eBook as a free gift. Watch your email after purchase. NON SLIP KIDS CHEF HAT. Mushroom Design has adjustable Velcro back for the perfect fit. LIGHT WEIGHT and DURABLE POLYESTER, machine washable and holds up to real world cooking. 100% MONEY BACK GURANTEE. If you are not satisfied with the product, return it for a complete refund. If you have any questions about this product by Chefocity, contact us by completing and submitting the form below. If you are looking for a specif part number, please include it with your message.